So, to start off, any type can be healthy or unhealthy. There are also different ways an individual can be unhealthy. Stress can trigger what’s called a “grip” reaction where someone becomes stuck in their inferior function. There are also personality loops; in the case of the INFP, this would be the Fi-Si loop. Then there are just immature manifestations of type which occur when someone hasn’t had the chance to properly develop. Keep in mind, I love INFPs and have nothing against them. This article is not meant to “bash” INFPs in any way at all. Any type can have various levels of health and can display itself in immature ways depending on the individual and what they’re going through at the time. Healthy INFPs are deeply in touch with their values, morals, and ethics. They are compassionate individuals who strive to live authentic, meaningful lives. They are often imaginative, creative, and quietly passionate. Many of them care for plight of the “underdog” or the marginalized and try to help those they see as vulnerable. They tend to be idealistic and open-minded; focusing on the future and what they can do to improve the world for themselves and the people they care about. INFPs will naturally value their top three functions a great deal (especially their dominant function). Like all types, they are at risk of having a warped perception of their other 5 functions (Yes, we DO use all 8 cognitive functions). As a result, INFPs can see their inferior Extraverted Thinking as overwhelming, domineering, or too hasty to decide or take action. They can repress this function, ignore it, or devalue it in other people if they’re not careful. This is especially true in childhood and adolescence, when the inferior function is less accessible. Because Extraverted Feeling runs in the opposite direction of the INFPs dominant function (Introverted Feeling), they can risk seeing it as intrusive, interfering, phony, or desperate to be liked. INFPs are at a risk of misreading the intentions of extraverted feeling types. Because Introverted Thinking is the INFP’s 8th function, they can risk seeing it as overly impersonal, detached, cold, and formulaic. All of us, regardless of our type, need to be aware that all the cognitive functions are useful and valuable. There isn’t one that is inherently better than another! This way we can improve our relationships with other types who process things differently than we do and form better relationships. INFPs who are especially unhealthy or immature can function with a warped introverted feeling process. They can be overly-sensitive, quick to take offense, and insistent that only their views and values are valid. They can be resentful and isolative, only allowing people into their lives that adhere to the same ideals and values. They may appear self-righteous and attached to the idea that they are somehow better than the rest of society, or a misunderstood “misfit”. INFPs who fall into this category have usually not had a healthy childhood or background with which to develop and appropriately express their functions. Usually INFPs are very open-minded and gentle individuals, but if they’ve had to be in a defensive stance for much of their life they may not be able to develop their supportive functions (like intuition, sensing, or thinking) to balance feeling and create a healthy mindset. To avoid getting into this warped perspective, it’s important for INFPs to develop their auxiliary Extraverted Intuition. This function provides balance for feeling. When feeling says “this is my value, it is right”, Ne says “hmm….let’s look at other perspectives and ideas and make sure we’re open to new information”. When feeling says “that doesn’t feel right to me”, Ne says “things are complex, maybe there’s a connection or something we’re missing here”. Ne helps the INFP to keep an open mind, see creative connections, possibilities, and new perspectives. But what happens when intuition is unbalanced or unhealthy? When this happens, the INFP will use Ne to create an idealized image of what the world should be and to form inspirational ideas of a perfect future. 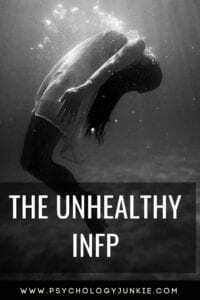 Unhealthy intuition can make the INFP seem unrealistic, impractical, eccentric, or ungrounded. They will feel pulled towards an idealistic future, yet they will feel unable to actually do anything to make their goals a reality. Repression of inferior thinking is part of the problem here; Te (extraverted thinking) is very focused on productivity and “making things happen”. When INFPs repress Te too much, they can get stuck in a place of speculation and idea-generating without actually putting their visions to work in the real world and creating a course of action. They can get very frustrated because they see a perfect future and so many possibilities, but they don’t know how to make any of their ideas actually happen and they are afraid to decide and move forward. Really, this is a combination of unbalanced intuition as well as undeveloped extraverted thinking. A) Repress their own feelings and try to convince themselves that everything is okay. B) Go the other way and imagine that others are all corrupt, thinking badly of them, and deluded. They may see themselves as the only people who see “the truth”, or the only people who really care to make a difference in the world. They can become especially harsh and critical of others and take on a martyr role, gradually secluding themselves from other people. Not every unhealthy INFP is going to fit the exact descriptions above. They may struggle with certain issues mentioned, or they may have more minor “symptoms”. Here are some other weaknesses to look out for. Because INFPs value introverted feeling to such a strong degree they can risk over-using it or relying on it at the expense of the other functions. They can “dig in their heels” in support of an ideal and can be very critical of those who don’t share the same ideals or who don’t live up to their hopes and vision. They can become so attached to a type of social justice that they see everyone with different viewpoints as unethical or “cruel”. Because Introverted Sensing (Si) is the tertiary function of the INFP, they can have diminished access to it in early life or they may exhibit immature expressions of it at times throughout life. In early life they can have trouble remembering details. As they get older they can become overly-focused on reviewing the past, getting stuck in particularly bad or embarrassing memories and feeling shame or anxiety about those memories. They may also rely on their own experience too excessively, using that experience to back up their feeling judgments. They may discount other people’s experiences because they are so different from their own. This tends to happen when INFPs are in a Fi-Si loop and they don’t have the balancing power of Ne to inform their perspective. INFPs who are experiencing chronic or extreme stress may fall into the grip of their inferior function, Extraverted Thinking (Te). When this happens, their other functions become less conscious and they seem as if they are “not themselves”. If you suddenly se an INFP “flip a switch” and act in uncharacteristic ways, it’s possible that they are in a grip phase of their life. INFPs, who are normally open-minded, compassionate and empathetic, become increasingly rigid, structured, and harsh when they are in the grip of Te. They can become sarcastic towards others and harshly critical of their perspective or viewpoint. They may seem overly-focused on efficiency and maintaining control of their outer environment. If you think you or someone you know might be dealing with a lot of stress, you can find tips specifically for their type here. Every type can feel lost when dealing with their 5th-8th functions. These “shadow functions” are more unconscious to us and harder for us to use in a conscious, effective way. INFPs can bristle at demonstrations of Fe, seeing it as overbearing, or overly conformed to social values. As a result, they can become stubborn about how other people affect or “impose” on them and can resist being responsible for the social harmony of “the group”. Simultaneously, they can have moments of being very tapped into what other people need and how to meet the needs of others. Because Ni fills the “critical parent” role, INFPs can use it as a way to criticize their own perspectives and plans. They may get locked into negative thoughts about how events will turn out. They can also have moments where Ni truly shines in them and they are able to find an sudden clear, positive vision that they can go after with determination and certainty. Extraverted Sensing fills the “trickster” role. As a result, INFPs can fool themselves (or others) by using perceived “realities” to back up their experiences and judgments. They will often use this in a way to catch people in “double binds” or situations or arguments they can’t win. At times, however, they can also tap into Se in a healthy way and use it to enjoy the physical world, notice beautiful details without reading into them, or experience physical thrills. Introverted Thinking fills the “demon” role. As a result, INFPs can completely ignore definitions and logical consistencies; adhering to certain principles without seeing the fine distinctions between them. They can also become critical of other people’s inconsistencies and flaws in logic. They can become ashamed and embarrassed by their weakness in this area and try to hide it as much as possible. They can also risk seeing people who use Ti as cold, detached, or uncaring. That said, at times INFPs can tap into Ti in a healthy way and find universal principles that can benefit them in their daily lives. Find out more about the shadow functions here. Each type can be healthy or unhealthy or somewhere in between! Do you have any input or experiences you’d like to share with other readers? Let us know in the comments! What are some good cities for an INFP to go to school and live in? I am an INFP. What I have just read today is quite true especially for myself. I was wondering to myself if there are such theories about what I am. So I found this page. I somehow fit in as the unhealthy INFP. Things that I do or said, I may not realize it but no, actually I do know and its difficult to control. Most of the time I see myself as cold-hearted, feeling superior based on my past experiences, or knowing that I am capable of being extremely independent that I dismiss the help, opinions or suggestions from those who are close to me. I am like this person with split personality. I can be positive, daydreaming and smiling, being nice and kind and loving to people today and the next I shut people away harshly. I throw tantrums too and I can go extreme like disappear myself and the next day being calm or talking to someone without expressing any emtions. I see myself as confuse at times, angry on some days or “zombie-mode.” Either Im this or that. It depends on where I am or whom Im with or totally a different situation. I am ok when there’s nothing intrusive that trigger the hidden pandora box at the back of my mind or heart. I have so many things to share but thats all I can summarized.